The primary focus of The Fund will be Downtown Miami, which is defined as a 3.86 square mile area east of Interstate 95 between the Rickenbacker Causeway to the South and the Julia Tuttle Causeway (I-395) to the North – the Eastern border is provided by Biscayne Bay. This area is further divided into sub-areas that include Brickell, Central Business District (CBD), Arts and Entertainment (A&E), Edgewater, and Wynwood (Midtown) areas. It is important to understand each of these sub-areas because each area is at a different phase of a secular development cycle and has unique characteristics. These factors lead to specific demand drivers for condos in each area, which will be factored into The Fund’s approach, in both the acquisition and disposition phase. The Arts and Entertainment District (A&E), is just North of the CBD. It is bound roughly by North 24th Street to the North, Interstate 395 to the South, by the Florida East Coast Railway and North East 2nd Avenue to the West, and Biscayne Bay to the East and encompasses less than a quarter mile. The A&E is an urban, residential neighborhood with many high-rise residential towers, as well as some smaller scale historic buildings. The area is home to the Adrienne Arsht Center for the Performing Arts, the old Miami Herald headquarters, and the Omni International Mall. Based on a 2016 study by Miami’s official Downtown Development Authority, the A&E has an estimated population of 14,675 people. Since 2010, the population grew by nearly 5,600 people based on Census data, and is expected to grow by nearly 26% over the next four years, to more than 18,400 people. Further, the A&E also has 8,188 households, an increase of more than 2,900 since the 2010 Census, and this is expected to grow by nearly 22% over the next four years, to nearly 10,000 households. Brickell makes up the Southernmost section of Downtown Miami and encompasses 1.14 square miles. Brickell is South Florida’s major financial district. Today, Brickell has grown to overtake the city’s historic Central Business District to the North, as one of the largest financial districts in the United States. With a fast-growing residential population, Brickell is one of Miami’s fastest-growing as well as its most dense neighborhood. Based on a 2016 study by Miami’s official Downtown Development Authority, Brickell has an estimated population of 34,975 people. Since 2010, the population grew by more than 8,500 people based on Census data, and is expected to grow by more than 9% over the next four years, to more than 38,000 people. 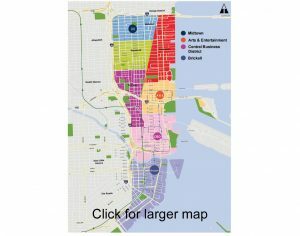 Further, Brickell also has more than 19,000 households, an increase of more than 4,000 since the 2010 Census, and this is expected to grow by more than 15% over the next four years, to nearly 22,000 households. The Central Business District (CBD) is the historic city center of what has become Greater Downtown Miami. It is generally bound by Biscayne Boulevard, Bayfront Park and Museum Park on the East, the Miami River to the South, North 6th Street to the North, and Interstate 95 to the West and encompasses .91 square miles. The CBD has the greatest concentration of high-rise buildings in the region, with more than 5,000,000 square feet of office space, and it is home to many major museums, parks, education centers, banks, company headquarters, courthouses, government offices, theaters, shops and many of the oldest buildings in the city. Based on a 2016 study by Miami’s official Downtown Development Authority, the CBD has an estimated population of 17,132 people. Since 2010, the population grew by more than 6,000 people based on Census data, and is expected to grow by more than 20% over the next four years, to more than 20,500 people. Further, the CBD also has 8,180 households, an increase of more than 2,700 since the 2010 Census, and this is expected to grow by more than 19% over the next four years, to nearly 9,800 households. Midtown is comprised of the neighborhoods of Edgewater and Wynwood, located North of A&E. It is roughly bound by North 17th Street to the South, North 37th Street to the North, the Florida East Coast Railway and East First Avenue to the West and Biscayne Bay to the East and encompasses 1.65 square miles. Midtown is primarily a residential neighborhood, with many historic early 20th century homes and high-rise residential towers to the East along Biscayne Bay. Based on a 2016 study by Miami’s official Downtown Development Authority, Midtown has an estimated population of 17,649 people. Since 2010, the population has grown by nearly 4,300 people based on Census data, and is expected to grow by nearly 19% over the next four years, to more than 21,000 people. Further, Midtown also has 7,852 households, an increase of more than 2,000 since the 2010 Census, and this is expected to grow by nearly 20% over the next four years, to nearly 9,400 households.